Business Sales are HOT! 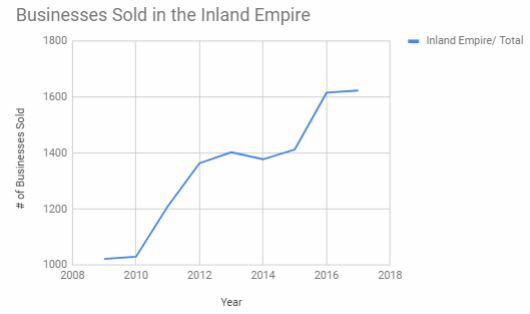 Through July of this year, 906 businesses have been sold in the Inland Empire (Riverside and San Bernardino Counties). Compare this to 2017 over the same period, when 892 business were sold, the number of closed transactions grew by 2%. This is great news for business owners that are considering to sell their businesses, the time may never be better. “It seems to me that qualified buyers outnumber quality businesses to purchase. When quality businesses are marketed to stand out from the hundreds of sub-par listings, we can expect great offers.” remarked Pablo Fonseca, Business Broker in Riverside, CA with 1-800-Biz-Broker. The sales of businesses has been growing over the past several years, but has it reached a peak? The graph below seems to imply we are at or near a peak. But if you consider that a tsunami of Baby Boomers will continue to retire and sell their business throughout the next decade (and beyond), we should be in a bull market. You can see yourself, the thousands of business for sale listings on sites like www.BizBuySell.com This is why the service of an experienced and professional Business Broker with the knowledge to properly package and market a business is key to ensuring that the quality listing stand apart. Number of Business Sales in Riverside and San Bernardino Counties. Since 2006 we have been helping entrepreneurs sell their businesses. We are the premier Business Brokers in Southern California. Are you thinking about selling your business? Contact us today for a confidential consultation and business valuation. Here are our current listings, businesses for sale. Here are are our recently closed deals. Just Sold Businesses. Daymond John Shout-out to Business Broker at 1-800-Biz-Broker! Closing the sale of your business should not be an afterthought, Closing is a big deal! Avoid the traps.